There’s a revival underway at one of the cathedrals of college basketball. Once upon a time, John Wooden paced the sidelines in this building and Wilt Chamberlain took the floor here. But this isn’t Pauley Pavilion or Allen Fieldhouse; rather, Municipal Auditorium in Kansas City. Municipal doesn’t have the instant credibility of The Palestra or Hinkle Fieldhouse, but it’s nearly as old as those fabled venues, and steeped in just as much history. Walt Hazzard leads UCLA past Duke in the 1964 final at Municipal Auditorium. This was the first of many titles for John Wooden and UCLA (msn.foxsports.com). Municipal has hosted more Final Fours than any other building in the country (nine) and the second-most total tournament games (only Dayton Arena, buoyed by the First Four, has hosted more). Wooden won his fist national championship on Municipal’s floor by beating Duke in 1964, his 16th season on the bench in Westwood. The win was also the finishing touch on Wooden’s first of four undefeated seasons at UCLA (30-0). 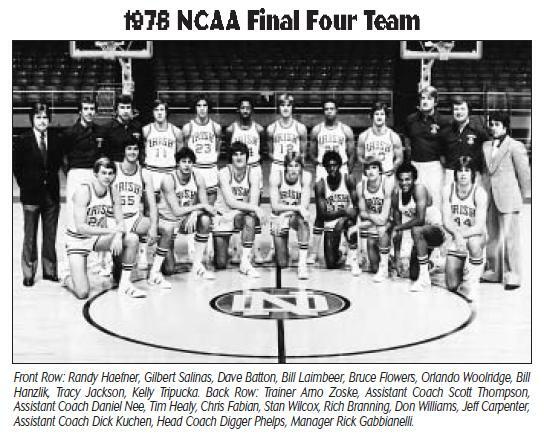 Three years before that, Cincinnati walked off Municipal’s floor as national champions, surviving a 27-point effort from Ohio State’s Jerry Lucas in the final. The Buckeyes got two points from a reserve forward named Bob Knight in the 1961 championship game; as it turned out, that one field goal wouldn’t be the pinnacle of his basketball career. Kansas reached the 1957 finals at Municipal on the back of Chamberlain (that tournament’s Most Outstanding Player), but fell in triple overtime to Frank McGuire-coached North Carolina. This was the Tar Heels’ first championship and second Final Four appearance, and things have gone pretty well in Chapel Hill ever since. Jesse Baumgartner is an RTC columnist. His Love/Hate column will publish each week throughout the season. In this piece he’ll review the five things he loved and hated about the previous seven days of college basketball. I LOVED…. starting this year off with what for my money was the best preseason event in recent memory. Combining the history of the Duke/Kansas/Kentucky/Michigan State programs with the incredible talent those squads have this year was a November treat for any college basketball fan who has grown tired of the NFL’s unthinkably terrible Monday/Thursday schedule this fall. Michael Wilbon said it right in his column after the game — this type of night makes college basketball relevant earlier in the year and gets people paying attention before January. I think you saw that same sentiment from those coaches, too, in their postgame interviews – this was not your ordinary non-conference event. I LOVED…. Jabari Parker. When I look at freshmen now, I put them through what I call the Kevin Durant Eye Test. When you saw Durant during his unbelievable freshman year at Texas, you stopped doing whatever it was you were previously doing. You thought, no way is this kid this big with these type of perimeter skills and that feathery stroke. 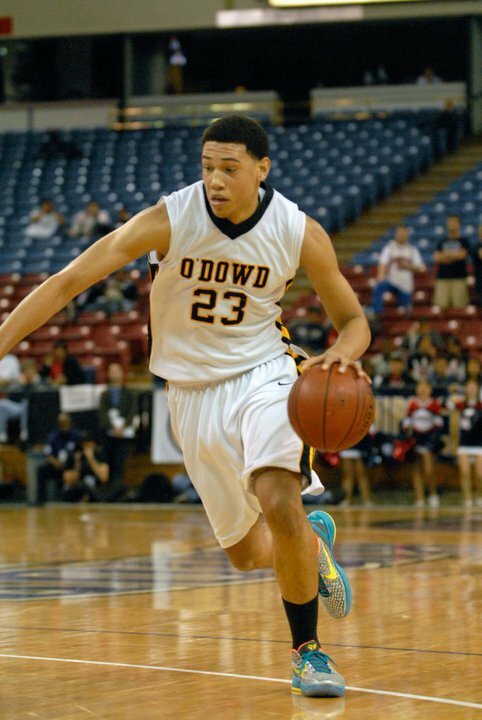 No way is he only 18, and no way would he not be making an impact on an NBA team right now. Parker passed that test, and this year is going to be fun. I LOVED…. that I still had to think about if the night’s star was Parker, because UK’s Julius Randle (Zach Randolph should sue for post-game style patent infringement) and KU’s Andrew Wiggins (who woke up for the second half against Duke to remind us what all the hype was about) delivered similarly eye-opening performances. I also loved that for how great Parker and Randle were, it was the more-balanced Jayhawks and Spartans that came out on top. I LOVED…. Kevin Ware back on the floor. It’s hard to remember the last time that everyone wanted to see a kid back on his feet more than Ware, whose gruesome injury last March caused America to collectively turn their heads away from the TV set. Making his first three-pointer was pretty great, but I loved this past week even more when Ware cut into the lane and bounced off of a two-foot jump stop for a high-flying finger roll at the cup. What a great story. Wednesday was a bit of a weird college basketball news day, mostly filled with quotes, non-controversies, and Andrew Wiggins. Ever heard of him? Let’s start with Jesus Shuttlesworth combined with Butch McRae (bonus points for that reference), otherwise known as Kansas’ young superstar, Wiggins. His fantastic Sports Illustrated cover started making the rounds on social media Tuesday night and Luke Winn’s profile story (print or digital subscription only) released yesterday. The comparison he makes is with another couple of former Jayhawk stars who came to the Great Plains to make their basketball marks, Wilt Chamberlain in 1955 and Danny Manning in 1984. Wiggins is the third star in this line of succession, but as Winn writes in his supplemental Wilt, Danny, Andrew: 22 Thoughts column (available online), “It is not a pronouncement that Wiggins will have a Wilt-like impact.” It is, however, an informative and compelling read, but his 22 Thoughts piece might be more fun. Over the series of blurbs, Winn manages to reference Neal Cassady, shows a ridiculous looking drawing of a giant “Wilt” hand dunking a basketball, and reveals some Wiggins-related tweets from starstruck KU students that will have you cracking up at the absurdity of it all. Check out both stories, even if you are so cheap that you have to read the paper copy in the checkout line at the grocery store. As we all know, Kansas also picked up Kelly Oubre from the class of 2014 earlier this week. The commitment was notable in that it represented the third straight time that uber-recruiter John Calipari had been beaten out for an elite recruit (Wiggins, Emmanuel Mudiay, Oubre). While three times isn’t necessarily a trend, it is a bit odd considering Calipari’s prodigious record of recruiting success. Well, at least one explanation for the commitment was revealed on Wednesday, as Oubre’s father, Kelly Sr., told the Lawrence Journal-World that Self “doesn’t kick you out if you’re not ready.” Although he didn’t name who he was referencing with his barb, it was interpreted by the rest of the world as a shot at Calipari’s one-and-done program (he later told KSR’s Matt Jones that he meant nothing of the sort). Kentucky fans rightfully took umbrage at the allusion, pointing out that a number of talented freshman have in fact become sophomores at Kentucky (Terrence Jones, Alex Poythress, Doron Lamb, to name a few), but the damage was already done. Kentucky vs. Kansas again, anyone — this is getting pretty good. Or Kentucky vs. Michigan State? Wait, we already have that one on the schedule, coming on November 12, just over a month from now. The background on this is somewhat convoluted, but the gist of it is that a student at Michigan State’s September Madness reported that head coach Tom Izzo said that the Spartans were going to “kick Kentucky’s a–.” John Calipari of course caught wind of it, and did what he does even better than recruiting and coaching — he spun it to his favor. In two separate public venues over the last week, Calipari has made reference to the MSU comment and spun it back to his own players “not knowing” when they will play the other elite teams on their schedule. Leave it to some other enterprising reporter to poll the Wildcat players as to when they will play the defending national champions (answer: December 28), but suffice it to say that the marketing pitch is already in full blast this season. Like we said, non-controversies. Players don’t know when they play, and coaches don’t know who they play. Does anybody pay attention anymore? We’re only half-kidding. Jeff Eisenberg at The Dagger published an interesting piece on Wednesday that revealed George Mason head coach Paul Hewitt and Saint Joseph’s head coach Phil Martelli didn’t even realize they were playing in the same conference (the Atlantic 10, if you’ve lost track) this season as recently as July. Even this week, Martelli mentioned that, as he waited for his train to Brooklyn, he wondered where his peer and longtime A-10 competitor Fran Dunphy at Temple was. Then he realized that Temple is now in the Big East, along with Xavier and one-year wonder Butler. Honestly, it’s going to take a while to get used to these changes for everyone. We really can’t blame them for this gaffe (but that doesn’t excuse the fictional Kentucky players that don’t realize who they’re playing). Some injury news to finish off a strange M5 on this Thursday (we warned you). Texas point guard Javan Felix underwent hip surgery last week and is currently on the mend with an indefinite timetable for his return. With all the pressure on the Longhorn basketball program given athletic director DeLoss Dodds’ recent disparaging comments, this is not good news for Rick Barnes. Felix is the most experienced returning guard on the team, and if he can’t go at 100 percent this season, Barnes is going to need to do the best coaching job of his entire career just to keep this team above water. Down at Florida, Will Yuguete and Eli Carter are still not ready to practice due to their injuries, but more importantly, Billy Donovan has reinstated senior guard Scottie Wilbekin to the team. Wilbekin has had found repeated trouble in his time at Florida, but he has satisfied his head coach in recent months to earn his spot again. The Gators are a tough team to figure this season — they bring in some excellent transfer and freshman talent, but the returnees more or less look like a collection of role players. We know they’ll be good, but can they become great? We do not need to tell you that Butler is one of the premier programs in college basketball, but we have to admit we were pretty surprised to hear that Chris Holtmann was leaving his position as head coach at Gardner-Webb to become an assistant coach at Butler. Holtmann, who was named Southern Conference Coach of the Year as he led Gardner-Webb to 21 wins last season and signed an extension through 2018 in April, is just 41 so we are assuming this is a move that will eventually get him a higher level mid-major job. We do not have the contract information for Holtmann at either location, but it also would not be unreasonable to assume that his salary as an assistant at Butler might equal or even exceed his salary as a head coach at Gardner-Webb. With his dismissal from West Virginia yesterday Aaric Murray has now been kicked two teams in his college career. Murray, who averaged 15.2 points and 7.7 rebounds per game at La Salle in 2011, averaged 8.8 points per game at West Virginia last season. Despite his fall off in production last season and his arrest for marijuana possession during the year he sat out, Murray should find a home soon as he graduated this spring and will be eligible to play this coming season. While Murray’s production (particularly at La Salle) will draw interest from many teams they should be weary of whatever issues have led him to be dismissed from two teams despite his considerable skill. It took over a month, but Roy Williams finally issued a statement about P.J. Hairston saying that Hairston “has made serious mistakes and there will be serious consequences as a result”. That statement may seem pretty strong, but Williams did not go so far as to say that Hairston would even be suspended instead pointing out that Hairston is only loosely affiliated with the school (not taking classes) or team (not practicing with the team) right now and is instead giving the legal system time to work itself out. This seems like a perfectly reasonable thing to do and realistically Roy has until November before he has to make a decision. Given Roy’s statements and Hairston’s actions we have a tough time envisioning Hairston in the Tar Heel lineup to start the season. With the summer here some college basketball sites are taking some time off and others are focusing in on recruiting, but no site is doing what Big Apple Buckets did analyzing 32 of Jon Rothstein’s predictions from last season. The analysis is not particularly rigid in that it does not necessarily call Rothstein’s predictions right or wrong as there can be some grey area in interpretation, which you can see in the comments section where the author and reader debate Rothstein’s record. Personally we think making bold random predictions are essentially worthless, but it is nice to see someone called out for those predictions even if the outcome is not as bad as one might expect. Finally, we bring you this amazing video courtesy of the Wilt Chamberlain Archive featuring Wilt Chamberlain playing in the 1957 NCAA Tournament. We will let the video speak for itself, but should point out how amazingly athletic Chamberlain looks against opposition that he physically dominates. Looking at this footage should give you an idea of why Chamberlain was so dominant and put up such huge individual numbers. What appeared to be a rebirth of basketball at UCLA is quickly turning into a potential nightmare as reports of a potential NCAA investigation into the recruitment of the Bruins top three incoming recruits has surfaced. We have known for a while that the NCAA was investigating the recruitment of Shabazz Muhammad, the star of the incoming class, but what is new is that the NCAA is also investigating the recruitment of Kyle Anderson and Tony Parker, both top 20 recruits. Details on the investigation are sketchy at best–it is not even known if this is tied to the Muhammad investigation or if this is a separate case. Whatever it is it is not good news for the Bruins who were hoping to become relevant nationally for the first time since 2008. UCLA’s crosstown rival USC had its own issues this weekend as the investigation into the Trojans own scandal revealed evidence that implicates former basketball player Davon Jefferson as well as football star Joe McKnight. One of the individuals being investigated reportedly admitted that he gave Jefferson $3,700 in cash. With the other issues the school has had they could be facing a fairly harsh penalty from the NCAA if there is sufficient evidence to substantiate the claims. If that wasn’t enough bad news, the school also announced yesterday that Maurice Jones, who led the team in scoring, assists, and steals last season, would miss the upcoming season after being declared academically ineligible. While the Trojans should be much improved from last season (read: not absolutely atrocious) this will clearly be a big blow to any NCAA aspirations they may have had. The Trojans weekend was probably only topped by the one that Billy Gillispie just experienced. Not only did the Texas Tech coach have to deal with reports of what some have called a “player mutiny” he was also hospitalized for an undisclosed medical condition. The news of the so-called mutiny should not be a shock given Gillispie’s reputation as the alleged injustices involved the hours they were practicing and “mental games” that Gillispie was playing. As for the hospitalization it appears to have been a hypertensive emergency where Gillispie’s blood pressure rose to dangerous levels, but from reports he seems to be doing well at this time. Even with that good news Gillispie has a lot on his plate when he gets out of the hospital. Wagner got a boost on Friday when the NCAA granted Dwaun Anderson a waiver allowing him to play for the Seahawks at the start of this season instead of January as some expected. Anderson, who was Michigan’s Mr. Basketball, had enrolled at Michigan State last summer before transferring to Wagner, which raised some question as to when he would be eligible. Anderson provides an already solid Wagner team with a level of athleticism that could bring the team, which is led by first-year head coach Bashir Mason, to another level assuming they can integrate him into their current group of players. If you are not familiar with Kansas forward Justin Wesley you may be hearing a lot about his exploits in the near-future even if it is not on a basketball court (well at least a real one). The Jayhawk junior, who averaged 1.2 points and 1.6 rebounds in 8.6 minutes per game last year, has been selected to portray the legendary Wilt Chamberlain in an upcoming independent film titled “Jayhawkers”, which looks at Chamberlain’s impact on race relations in and around the Kansas campus. There is a chance that this film will not get made due to a legal dispute with the Chamberlain family not to mention some questionable funding issues. Given the nature of the film, which is being made by a Kansas professor, we suspect that the film would not spend too much time on the court where the only part of Wesley’s game that resembles Chamberlain’s is his free throw shooting (49.9% for Wesley and 51.1% for Chamberlain) or the Big Dipper’s prodigious appetite for, uh, extracurricular activities. When Missouri and Texas A&M bolt for the SEC in July, the departure will mark the Big 12’s first shift since its inception in 1996. For the most part, the past 15 seasons have belonged to Kansas, which has captured the only National Championship during this time period and has also won or shared 11 regular-season championships. The Jayhawks’ dominance extends all the way through the old Big Eight’s history, too. Naturally, we’ve selected two Jayhawks as the most influential figures. 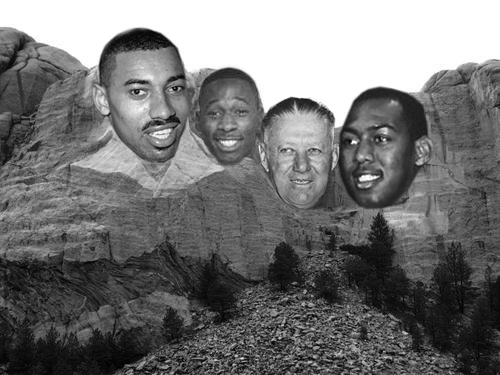 Perhaps it’s unfair to place so much KU emphasis on our four Mount Rushmore selections, and yes, it’s probably unfair to ignore the rest of the league as a result. However, we made our selections with an eye toward postseason success and long-term legacy. Frankly, no other Big 12 program can even come close to Kansas in either of those departments, so its players and coaches simply must be included. Wayman Tisdale: The late Tisdale was more than just a basketball player. He was a musician, a man who publicly fought cancer for two years, and most importantly, a man remembered for being one of the most genuine people in sports. The forward had a productive NBA career, but he thoroughly dominated the Big Eight for three seasons at Oklahoma. As a freshman, sophomore and junior, Tisdale took home Big Eight Player of the Year honors, and he was unique in that he made such an immediate impact early in his career. Unlike most freshmen at that time, Tisdale didn’t need time to acclimate himself to the college game. He was a one-and-done kind of player who stayed and dominated the nation for three seasons. Frightening. Danny Manning: These days, Manning roams the Kansas sidelines as a towering, hard-to-miss assistant coach. Two decades ago, though, Manning’s Jayhawks soared through the 1988 NCAA Tournament as a six-seed, shocking the nation by knocking off #1 Oklahoma in the title game in Kansas City. To this day, even fans who never watched Larry Brown’s team play still refer to that squad as “Danny and the Miracles.” Manning may have scored the most points in Big Eight history, but we’ll remember him for the way he lit up the scoreboard in those six games in March. For two teams that aren’t near each other, play in different conferences, and don’t have some sort of natural relationship to one another, it’s not an exaggeration to say that North Carolina and Michigan State have an intense and storied rivalry. It’s a rivalry that started out with an absolute bang. In 1957, Michigan State had a breakthrough year with it’s first share of the Big Ten title and a run in the NCAA Tournament that took the Spartans to the Final Four. There, in the semifinals, the Spartans took on the undefeated Tar Heels in a triple overtime thriller that resulted in UNC eking out a 74-70 win. This led to a championship clash with an also-undefeated Wilt Chamberlain-led Kansas team that somehow also resulted in another triple overtime slugfest and a 54-53 North Carolina victory for Frank McGuire’s team. It was North Carolina’s first national championship. In a consolation game, Michigan State would go on to play the two-time defending champions, San Francisco, which was making its first Final Four run without the great Bill Russell. With all the big names, undefeated teams, and pair of triple overtime games, it was undoubtedly one of the best Final Fours in history. 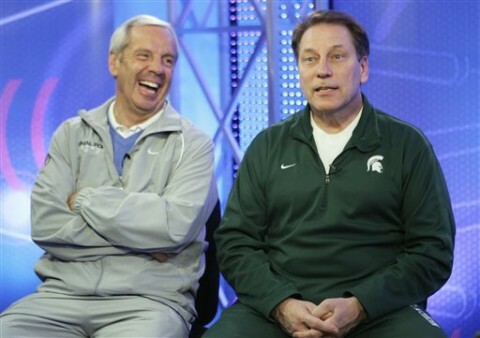 It was also only the beginning of the Spartans’ rivalry with the Tar Heels. Since that first fateful meeting in the 1957 Final Four, it seemed like these two teams were destined for postseason clashes. On five separate occasions, the two have squared off in the NCAA Tournament, and, unfortunately, for the Spartans, each game served as a bitter reminder of ’57. What the ’98 and ’07 clashes lacked, the ’05 and ’09 matches made up for in terms of stakes and drama. The ’05 game was another Final Four bout that was chock full of exciting moments, while the ’09 championship tilt was a remarkable rematch between two teams that had played each other at Ford Field once already that season. Of course, the rematch turned out to be nearly identical to the regular season game and quickly turned into a UNC rout. Who’s Got Next? is a bi-weekly column by Josh Paunil, the RTC recruiting guru. We encourage you to check out his website dedicated solely to college basketball recruiting, National Recruiting Spotlight, for more detailed recruiting information. Twice a week he will bring you an overview of what’s going on in the complex world of recruiting, from who is signing where among the seniors to who the hot prospects are in the lower levels of the sport. If you have any suggestions as to areas we’re missing, please let us know at rushthecourt@yahoo.com. Last week it was the Nike EYBL, this week it’s the Pangos All-American Camp. Last week Class of 2012 small forward Shabazz Muhammad (#3) got his own section and this week Class of 2013 power forward Julius Randle (Watch List) gets his own section. Last week Class of 2012 point guard L.J. Rose (#20) named UCLA as a favorite and this week he elaborated on that. As you can tell, there are a lot of parallels between last week’s column and this week’s column but there are some things (or should I say people) that weren’t mentioned in the previous Who’s Got Next? column: Kobe Bryant, LeBron James, Wilt Chamberlain, Moses Malone, Kareem Abdul-Jabar, Candace Parker and ‘The Jewish Jordan”… not to mention a Twitter recruiting scandal. Junior Brandon Ashley (#4) looks to cut his list in the next couple of weeks. We were granted the opportunity to speak with Bill Laimbeer, a 4-time NBA All-Star, member of 2 NBA Championship teams (“The Bad Boys”) and former team captain of Notre Dame as part of a promotion that Coke Zero is doing for http://www.TasteTheMadness.com. I have to say going into this interview I was a bit apprehensive. I’m not the world’s smoothest sports interviewer on the planet (as Seth Davis can probably attest to) and Bill Laimbeer has a bit of a reputation although looking back now I can’t remember any Jim “Chris” Everett moments from Laimbeer so maybe my concerns were unnecessary. It turns out that he was much friendlier than I expected and actually laughed at a few of my jokes. Even though it was part of the Coke Zero campaign, we spent most of the interview discussing basketball (college, NBA, WNBA, and even Boston fans like Bill Simmons) and not just the promotion. One of the things that stuck out when I reviewed the interview was that Laimbeer still seems to harbor some animosity towards Digger Phelps, who coached him at Notre Dame. Looking back I probably should have dug deeper into that, but we were on a schedule. If either Bill or Digger are reading this, shoot me an e-mail at rushthecourt@gmail.com and we can get to the bottom of this. RTC: Coming from the West Coast, what made you decide to go to Notre Dame? BL: Well, a few reasons. One was that my parents were moving from Los Angeles to Ohio at that time after my senior year of high school. That played a little part in it. The second part was that I thought Notre Dame was a national university both basketball-wise and school-wise, and I spent most of my life in the Midwest, but I spent my high school years in California so it seemed like a good fit. And Notre Dame was on TV every other week. There was only one game a week on TV.